Diesel, A Bookstore in Oakland presents another installment of the always excellent Poetry Flash, this time with Alicia Suskin Ostriker and Philip Memmer, on Sunday, July 15th at 3pm. Alicia Suskin Ostriker's new book of poems is The Book of Life: Selected Jewish Poems, 1979-2011. Ilya Kaminsky calls it "A Song of Songs, which is not Solomon's but Alicia Ostriker's. A great ages-old hymn to life, to flesh, to memory, is revised again on these pages, with gusto, with passion, with clarity, with eros, with grief." 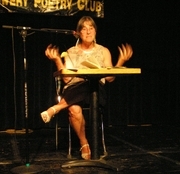 An incisive critic and a major American poet, she has published fourteen books of poems, including The Book of Seventy, The Mother/ Child Papers, and No Heaven. Among her honors are the William Carlos Williams Award, the San Francisco State Poetry Center Award, and the National Jewish Book Award. Philip Memmer's new book of poems is The Storehouses of the Snow. Alicia Ostriker says, "Bitter and brilliant, ardent and persistent, The Storehouses of the Snow is a book to read - no fooling - alongside the Book of Job. Every poem here made me catch my breath in astonishment at Philip Memmer's bold imagination and the sacred relentlessness of his quest." His previous three books include Lucifer: A Hagiography, winner of the 2008 Idaho Prize for Poetry; Threat of Pleasure, winner of the Adirondack Literary Award for Poetry; and Sweetheart, Baby, Darling. Alicia Ostriker is currently considered a "single author." If one or more works are by a distinct, homonymous authors, go ahead and split the author. Alicia Ostriker is composed of 7 names. You can examine and separate out names.